v1.1: Updated the code to support new versions of jQuery and added support for Surveys (tested in SP2010). In this article will show you how to limit the number of allowed selections in a column of type “Choice: Checkboxes (allow multiple selections)”. The reason for this is that a column of type “Choice: Radio Buttons”, cannot be “unselected” once it is selected. The code gives you the ability to specify the number of options a user can select. The script behaves differently for “single choice” and for “multi choice”. Multiple: A message appears beneath the checkboxes announcing the allowed number of selection. You cannot select another option until you have removed one of the previous selections. The “errorText” will disappear after 4 seconds. FieldInternalName: FieldInternalName of your “Checkboxes-column”. allowedSelections: Number of selections allowed. 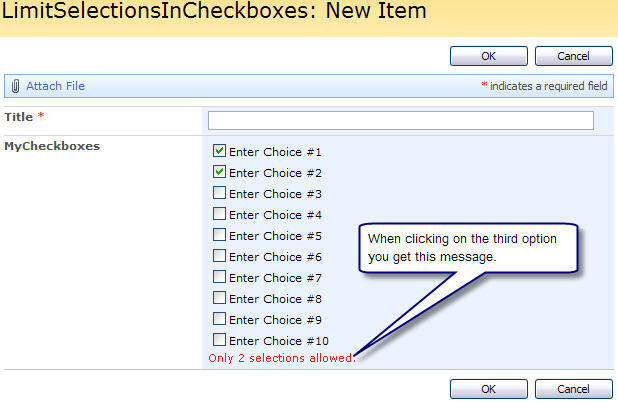 errorText: The text shown below the checkboxes if the selections exceed the allowed number of selections. Not used if the parameter “allowedSelections” is 1. Save this code as “LimitSelectionsInCheckboxes.js” – mind the file extension, and upload to the scriptlibrary as shown above. Ask again if this do not answer your question. Sorry to disturb you but Im a beginner in sharepoint. If possible, could you explain how to first implement this solution in sharepoint step by step? eg. How to create a Newform, Editpage. I’m currently implementing this limit checkbox selections in sharepoint, by using the standard sharepoint survey and an add-on named Kwizcom surveyplus. The clue I found was to edit the xslt file which came with the add-on.This file is for the survey questions, but I am unfamilliar with xslt. The NewForm and EditForm is the default forms created by SharePoint for any list. The NewForm is where you first fill in the form, the EditForm is the form you use when you modify existing list items. This solution is made for a standard SharePoint list, and a survey has another layout. It will work in a standard survey, but will not display the “errorText”. It’s just a minor modification to make it work though. I have however no knowledge about this add-on so i would recommend you to test it in a standard SharePoint list or survey to verify that you get it working. The step-by step is just to add a CEWP below the form, add the CEWP code from the article – change the script src to your locale files and it should work. If possible, could you post a tutorial on how to limit the checkboxes in a standard sharepoint survey? It is done in exactly the same way as described in this article. 1. i created a list with 4 column. 1 column is a “single line” type. 2. another 2 column is a “choices’ type. 3. When i create a “new item” and filled the second column more than 2 choices, the alert say “only 2 section allowed” appears below all other column. And it stays ther except the one below the first column. I only want the limit to be tagged/appeared at second column(field) only. You have the FieldInternalName wrong. I have a survey list, where I would like to use your script in order to limit the number of allowed checkbox selections to 2. I can make the script work on a normal custom list, but when I apply it to my survey, nothing happens. I have a feeling that the issue may have to do with the FieldInternalName. What is FieldInternalName in a survey? Is it the full question? You must also replace “ms-formbody” with “ms-formbodysurvey” in the script. Thank you so much – I got it working. It’s great. I am using this company provided sharepoint site. (I don’t own this sharepoint server). I believe I have restricted access to edit certain things on this site. I don’t own the server. But to this site (internally they call it CoP) I have full control over it. However, I couldn’t continue with adding CEWP and how do I create the LimitSelectionsInCheckboxes.js and upload it? I do not think you can use this solution if you are not allowed to add a CEWP. You are having a very good commande on java script. This behavior would indicate that you are using the wrong FieldInternalName for your field. Thank you a lot for this piece of knowledge. I’m trying to use it on SP2010Std survey. However, it’s not possible to switch CEWP to HTML source, as survey is no-ribbon list. Are there any workarounds to achieve this? I’m tidying up in old unanswered comments, and found this. looks like I’ve found a small bug in this great script. I’ve managed to make it operational for SP2010 survey, but only if filed name (and that case it is question as well) consist of 1 word. Adding one more makes it non-operational. Test case: it was ok with question “Choice” and not ok with question “RCA Choice”. Although it’s not a big issue, I’d be grateful if you suggest how to resolve this. Could Denis or Alexander post what you did to make it functional with an SP 2010 survey. I’m looking through the code and get see why its is not working!? Hello, The above script is excellent. I am also making use of SP Services cascading menus on my survey – when I insert the below script the cascading menus fail. I attempted to modify the above script to make it work with a survey but I was not successful. The Which_x0020_of_x0020_the_x0020_f is the internal field name of the choice check box field. It’s not working with SP 2010. Any Idea? Have you put the CEWP below the form? Please note that this code is for unmodified forms only. Shoudl i change smth in your code and put there names of my fields? UncaughtReference error: inlimitselections is not defined ? Ok i got it working for me now, but other users surveys limit fails. Should i edit some Masterpage to make it working? Sorry for the late reply, but I have a hard time following up all the comments and emails. This solution is applied only to the form you have edited. To make it global, you must add it to the master page, but I’m not sure this is a good idea as the column names and the ranges will differ. -Alexander can you tell me why I cannot got the result even I has do all the step that you provide. My check box list cannot be limit, currently I’m using sharepoint 2013. Did you test with the updated script (posted October 22)? I just tried them in Moss 2007 but failed. I tried it in Survey but it didn’t work..
I’m using the latest script from your site and put right ‘FieldInternalName’. Look at the developer console (hit F12 > Console) – any errors? Also, ensure you put the code BELOW the form. Not sure what you mean, but the code should be easy to adapt if you look at it.